Gum disease affects a wide number of Americans, but its signs are surprisingly easy to ignore. Because many people focus their attention on issues with their teeth instead and gum disease is frequently painless, it is possible to overlook the symptoms of gum disease until they’re quite serious. Unfortunately, while the signs of gum disease are easy to disregard, its effects are not; indeed, gum disease is one of the leading causes of adult tooth loss. Luckily, paying attention to the early symptoms of gum disease can allow you to treat the issue before it leads to more serious consequences. Maintaining a regular tooth brushing routine combined with daily flossing is both the easiest way to prevent gum disease and an opportunity to spot the signs of gum disease before they become serious. Here are six signs of gum disease that you shouldn’t ignore. 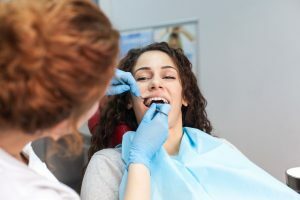 While pain typically doesn’t develop until gum disease has increased in severity, any pain in your gums shouldn’t be ignored; for many people, tenderness or discomfort in the gums or teeth is the first symptom of gum disease that they notice. While healthy gums that are free from disease look firm and pink in color, gums that are experiencing gum disease can swell and turn red or purple in color. Do you have a persistent bad taste in your mouth that won’t go away, no matter how much mouthwash you use? It could be a symptom of gum disease. Like an unpleasant taste in your mouth, bad breath that doesn’t dissipate with regular tooth brushing or flossing can be a sign of gum disease. Healthy gums don’t typically bleed from regular tooth brushing or flossing; if your teeth do bleed during your normal oral hygiene routine, you may have gum disease. Changes to your teeth spacing is one of the possible more serious effects of gum disease. As your gums recede due to the effects of gum disease, spaces can develop between your teeth. This can allow pockets to form that let bacteria build up in your mouth. In turn, these pockets can affect the way your teeth line up when you close your mouth or cause your teeth to feel loose. If you’re displaying any of the above symptoms of gum disease, make an appointment with Preserve Parkway Dental as soon as possible for a professional assessment. Gum disease in its early stages is known as gingivitis; gingivitis can be treated with a deep cleaning performed by Preserve Parkway Dental in Eden Prairie, MN, often in combination with a round of antibiotics. More advanced gum disease is referred to as periodontitis. If your gums have begun to pull away from your teeth and create pockets, you likely have this more serious gum disease. Because periodontitis is one of the leading causes of tooth loss, getting treatment as soon as possible is key to preserving a healthy smile.